I love using other peoples work in my designs. The Salvage jewelry that I make is a celebration of the artistry of another era. One where fine craftsmanship and attention to detail were prized. I do not know these artists of old but I seek out their work in unlikely places. My favorite shopping and collecting spots are architectural salvage yards, flea markets, garage sales, fossil and mineral shows, piles of "stuff" washed up on the beach, and junk drawers. I have been known to cause a pedestrian traffic jam in the city by stopping to pick up an interesting bit of trash. The necklace pictured above is made up of the inner gears and plate of a vintage watch. Note the etched detail of the company name on the part itself. That lovely detail was hidden inside the watch case. Only the maker saw it. Trilobite Fossil wrapped in brass. Bless the fossil collector that dug this amazing trilobite specimen out of the Wheeler shale formation. I have tried rock collecting with picks and shovels, it's not for me. I am happy to leave it to an expert like my source friend in Utah. 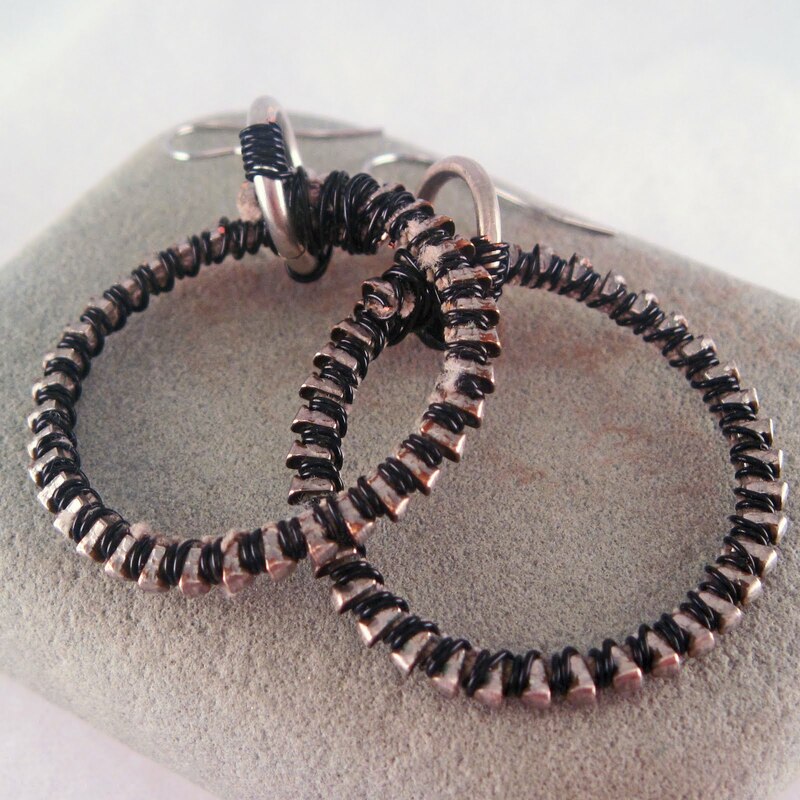 These earrings were made from an old metal garage sale zipper. I have been known to purchase a garment for the appearance of the zipper and/or buttons. Old religious medals are some of my favorite components. These little treasures are beautifully made and full of meaning. I love finding them in the bottom of the sale bins or 10 cent buckets at garage sales. One of my favorite sources of other peoples work is broken vintage jewelry. The rhinestones in this bracelet used to be a shoe clip. Old chains, lonely earrings and broken vintage watches all find their way into the workroom. Other peoples work, incorporated into my own is a large part of the signature style of The FamiLee Jewels. I love your vintage work, Bonnie. With your eclectic collections of others' bits, pieces and baubles you create a wonderful style all your own. Introspection at the top is really something. So much to look at and consider. Love it! Thanks Jeanne. Introspection was an effort to make the inner workings of my brain visual, rusty gears and all! I look at buttons on garments when I'm in thrift shops all the time.... I have thousands of buttons...Guess I really should start using them in jewellery! Really like what you've done with al your found objects! What a lovely post ... I loved vintage things and it's always nice to know other care about them too AND put them to good use. Inspiring - you have created so many gorgeous pieces - your ability to see the beauty in simple items and transform to gorgeous jewels is pure art.